FlyerTwo rig (optional): main alone 51 sq.ft. ; main & jib: 70 sq.ft. DragonFlyer 3.2 is designed to be a great boat for all ages to build . . . then to learn to sail (if that's where you're starting) and sail (and race, if that's what's most fun), with two different mast and bowsprit positions and three different rig options (main, main & jib, with asymmetrical.) Moving the mast and/or bowsprit are simple operations, so re-rigging the boat for different sailors or conditions takes a little bit of doing but is reasonably quick and easy. DragonFlyer is an ideal boat for kids since she's designed to be a good boat for learners but she's also fun, fast, and won't be outgrown, she can grow up along with the abilities of her young sailors. 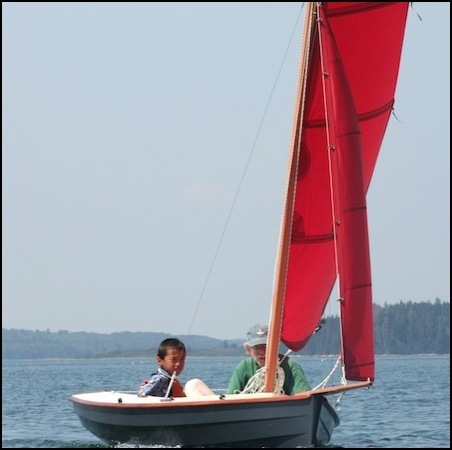 But she's far from “just a kids' boat"; we took the main sail and early design sketches to the WoodenBoat Show a couple years ago and we've talked to lots of people since, and many many of the eyes that have lit up and lips that have said "I want one!" were attached to adults. 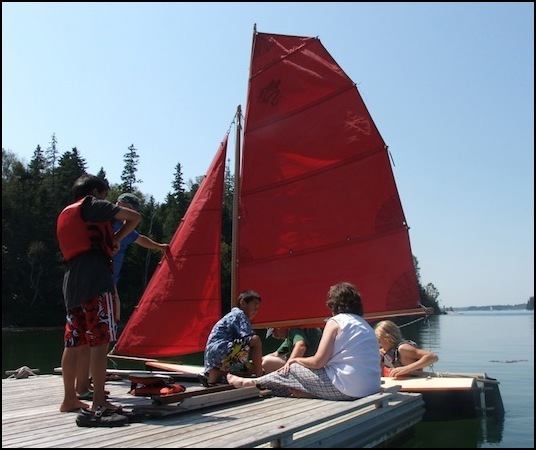 Kids immediately love the boat but adults love the idea of one for themselves, light, simple, easy to move/cartop and take out whenever the day says "go sailing . . . now!" And parents/grandparents love the idea of a boat that the kids/grandkids can learn to sail in and have a blast that is also a boat they (the adults) can have some serious fun with. We've designed a lot of boats, built quite a few, and they've always been met with admiration of many and great affection from their owners. But DragonFlyer is a little different. When people see her out sailing or at a show, they love the design, love the concept, love the idea of building one, and when they get to sailing one . . . well, that's when it's . . . a little smile, a big grin, and off they go . . . . Since then, Zip has been to the WoodenBoat Show in 2014, where John and Leigh (our oldest daughter, thirteen) had a lot of great talks with people, and since she was in the water for that show, they took her out sailing in the harbor at Mystic Seaport, Connecticut. Zip the DragonFlyer won the show’s overall Concours d’Elegance award for Outstanding Innovation. 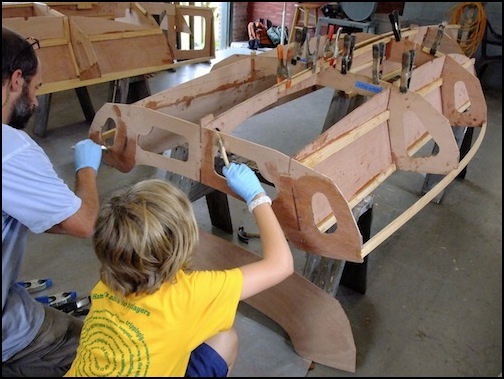 in August 2014, we built DragonFlyers with four families during WoodenBoat School’s family week. They worked hard, learned a lot, and had fun! Sailors of all ages, from third grade to grandpa, have sailed Zip. 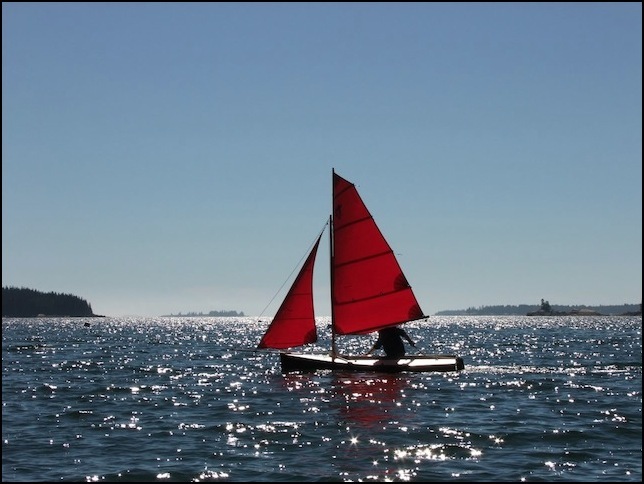 Two adults can sail together, or an adult or older kid with a younger one, or an adult or ready-to-solo kid alone. The flexibility of two rig sizes plus the ability to sail with main alone, or to sail with main and asymmetrical, give the DragonFlyer the ability to fit a wonderfully broad range of conditions and abilities. No matter you ask of her, from light winds to a whole lot more than, from a quiet sail to a whole lot more than, she loves it . . . and so do those sailing her. DragonFlyer is designed as a kit. 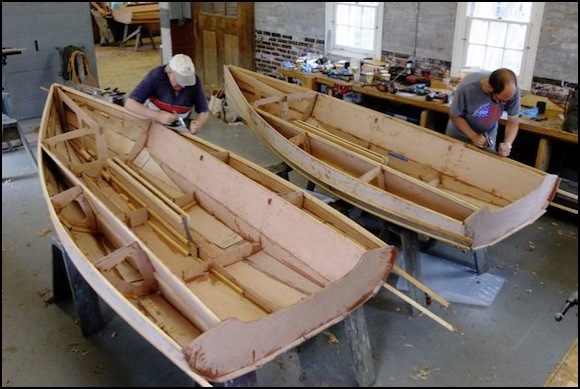 Kits and built boats are available; please see details and ordering info. 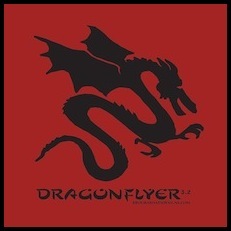 If you’d like to be on the DragonFlyer update mailing list, please let us know and we’ll add you. Or, like us on Facebook and follow along there.